Monday - Friday | 7 a.m. - 10 p.m.
Saturday | 11 a.m. - 9 p.m. 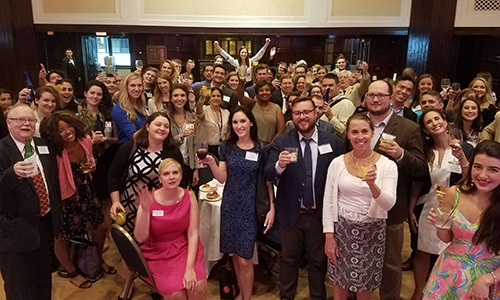 The National Press Club, founded in 1908, offers career development and social opportunities for journalists, public relations and communications professionals. Whether brand new to the industry or a seasoned veteran, NPC has a membership spot for you. Interested in joining? Email join@press.org or apply online for membership. Current members: Email members@press.org for details. Parking: Spend $25 or more at the Reliable Source or Fourth Estate restaurants and get free parking at the PMI Garage at 1325 G Street after 5 p.m. on weekdays and all day on Saturday. Ask at the Club front desk or in the Fourth Estate for validation. 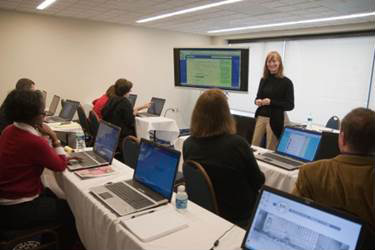 Training and Workshops: Working with the National Press Club's Journalism Institute, Club members receive early access and special admission rates to classes and training. Recent workshops include: personal computer security and encryption, tracking corporate welfare in your city and state, a Snapchat Bootcamp, on-camera training, how to navigate Congress.gov taught by the Library of Congress and a guide from C-SPAN on using video clips from its extensive online collection. Networking and getting involved: Membership creates real life connections beyond strings of emails or Linked In requests. The Club’s variety of internal teams generate the majority of the Club's programming where volunteers book speakers, organize social events, plan panels, suggest trainings or write for our internal newsletter. Developing Club programs offers fantastic networking and leadership opportunities and a chance to gain other skills outside of day-to-day work responsibilities. Membership Directory: Using a password-protected login, find other Club members in the Washington, DC metro area or around the globe by organization, coverage topic or other details. reserved table during the luncheon events. General admission seats are first come, first served. Admission to VIP receptions before certain Club events. An email to VIPreception@press.org no later than 48 hours ahead of select events means a member may receive an invitation to meet lawmakers, celebrities and other newsmakers. Members also have the opportunity to sit on the head table and be introduced live on C-SPAN along with the speaker and other Club members on the dais. Ticket discount and early access: For other NPC ticketed events, members receive a discount code for our Eventbrite registration and advance notice for events before admission goes on sale to the general public. The Wire: Membership includes a subscription to our internal newsletter listing future events, Club member notes and coverage of previous events. The member-produced email hits inboxes by 1 p.m. on Monday and 9 a.m. on Wednesdays, Thursdays and Fridays. Reciprocal Clubs: The National Press Club has agreements with other private and journalism-based clubs in 25 states and 26 countries worldwide. Each offers different resources and services, including overnight accommodations. Members can access the full list and request a letter of introduction up to 48 hours ahead of their visit. Guest Passes: Two complimentary passes a year gives a friend or colleague guest access to all the Club's resources and facilities for 10 days. Downtown workspace: A short walk from the White House and other popular downtown news locations, members can charge a cell phone or tablet, file their latest story, upload photos or video, connect with clients or use some down time in between appointments to get work done in downtown Washington, DC. Our clubhouse has password-protected Wi-Fi, cubicles, couches and plenty of space to work. 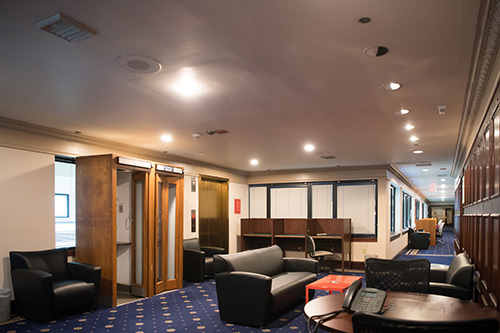 Members can get a little more privacy for cell phone calls using the phone booths rescued from the U.S. House of Representatives Press Gallery and donated to the Club in 2015. Podcast/Small studio: Members can reserve the small studio on the 14th floor to record interviews or podcasts using their own equipment for up to two hours at no cost. Our full service Broadcast Operations Center on the 4th floor can provide support and equipment for bigger or longer projects. The Eric Freidheim Library: Part of the National Press Club's Journalism Institute, the library has a conference room members can reserve in two-hour blocks for up to six people to conduct pen-and-pad interviews, discussions with clients or hold other meetings. The library also has three desktop computers for member use, a Bloomberg terminal, Reuters access to check the daybook and wire stories, and numerous newspapers and magazine and books for circulation. Library staff can conduct Nexis searches or provide other research help. Fees apply depending on the nature of the request. The library can be reached at library@press.org or (202) 662-7523 for more details. Fitness center: Work out in the NPC Fitness Center with our on-site personal trainer at no extra charge. The gym includes free weights, weight machines, treadmills, elliptical trainers, and bikes. Our new, completely renovated locker room offers lockers, showers, toiletries, and hair dryers. Some members use their locker room as a home base before running on the National Mall. The Reliable Source Bar and Grill: Home to the very first liquor license in Washington, DC, our members-only bar and lounge serves as the heart of the Club. The Reliable Source is a full-service restaurant for lunch and dinner. With an updated menu daily, members can grab a quick hot buffet or salad bar lunch for less than $20 or entertain sources, clients or guests in a private restaurant setting. The restaurant also hosts monthly specials such as crab night, Chinese New Year, St. Patrick's Day buffet or other events. Happy Hour - 5 p.m. to 8 p.m. Monday through Thursday - includes $3.20 wine, $3.20 beers, cocktail specials, fresh popcorn, cheese and fruit platters or other complimentary snacks. Taco Night - 5:30 p.m. to 7:30 p.m. every Friday. A 30-year tradition of a complimentary taco bar for members and up to five guests with a two-beverage purchase. The Reliable Source also includes the McClendon Room and the Cosgrove Lounge where members can host events with no rental fee. From a board dinner, client retreat or office training session to a baby shower, fantasy football drafts, birthday happy hour or other events, the staff is happy to work with you to create a menu and pricing for any AV needs. Email Reliable Source Manager Mesfin Mekonen at mmekonen@press.org for more details. The Truman Lounge: With comfortable couches and arm chairs surrounded by a wall of televisions airing the news of the day, members can work in the lounge, enjoy coffee or cocktails. Named for former President Harry Truman, who played the piano at the Club in 1945, the lounge serves as a gathering spot for many member events. The Fourth Estate: Members receive a 15% discount at the Club's fine dining restaurant. Executive chef Susan Delbert uses locally-grown produce and meats for an American-style menu that elevates taste above trendiness. Chef Delbert works with organic and small farmers in the Chesapeake Bay watershed, giving her access to the freshest, most flavorful produce, cheeses and meats. Club’s prestigious Fourth Estate Award. Several times a year via the Club's Wine Dinner series, the Fourth Estate hosts Chefs opening a new restaurant or promoting a cook book to prepare a wine-paired meal especially for members and their guests. Chefs Marcus Samuelsson, Pati Jinich, and Alton Brown are just some of the names that have cooked for us. 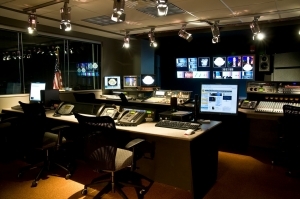 Broadcast services: The staff of our full-service in-house Broadcast Operations Center can create a package to include use of our television studios, edit bays, conference rooms, a VIP lounge and a professional make-up room. Our video team can shoot and produce events in our studios, in the Press Club itself or at your event anywhere around town. Full-service catering and events: From multi-day conferences and galas to weddings, workshops, conferences, private dinners and panel discussions, the National Press Club events staff will put together a package taking care of everything from food and beverage to audio-visual needs and all the details in-between – with a 15% discount on room rentals. Discounted tickets to Blues Alley: NPC members receive a half-price discount for all Sunday through Thursday Blues Alley performances based upon availability. Special performance ticket prices from Arena Stage and National Theater throughout the year. National Press Club members can receive up to six months of free language learning services through a special offer from Babbel.com. Email members@press.org for more details. Watch the Wire or www.press.org for new benefits or changes to existing ones.